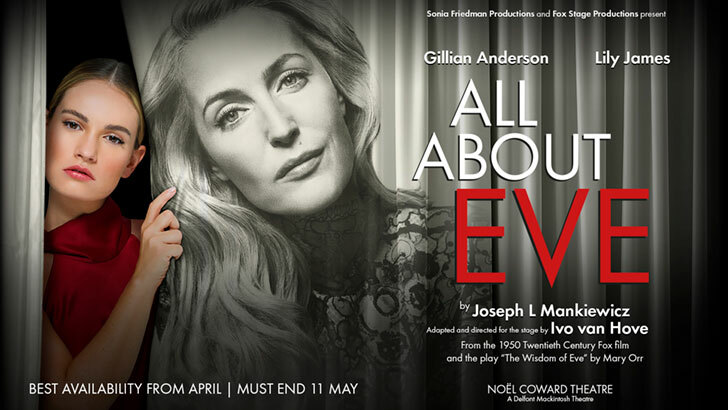 Last night Stuart and I went to see the film-to-stage version of witty showbiz melodrama All About Eve at the Noel Coward Theatre in London's glitzy West End. Starring Gillian Anderson as Margot Channing, Lily James as Eve Harrington, and directed by Belgian director Ivo van Hove the evening was everything we thought it would be - professionally produced with a full-on (if at times slightly muddled) multimedia staging, a perfect cast, great acting, and a plot that stuck to the film script like a stage-door limpet to a star. We liked it. We really did. But we didn't love it. 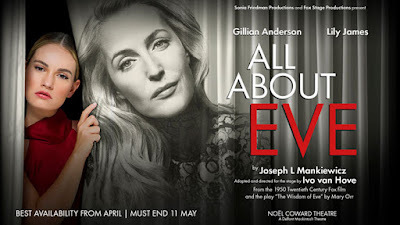 It begins, like the film, with the honey-voiced critic Addison DeWitt (Stanley Townsend), "as essential to the theatre as ants are to a picnic" setting the scene and telling us Eve has won a prize. Then, as the story unfolds backwards, Ivo van Hove reveals his brilliance at producing (over-producing?) West End plays with two hours of whirling scenes on and off stage, close camera work, special effects galore, and rapid costume and scenery changes. It was a heady mix of theatrical wizardry. As the action gets going, we get to meet superfan Eve, in the glamorous shape of Lily James, lurking outside the theatre where Margo is performing. As Margo's friend Karen (Monica Dolan) ushers her inside, Jan Versweyveld's terracotta box of a set rises to reveal backstage clutter, a mirror with bright lights and huge portraits of Margo the star set against the brick walls. Excellent though Anderson is as Margo, she never really finds a way to banish Bette Davis' shadow, despite a performance full of flickering nuance. Granted she manages to say more with a curled lip and a slight shift of her eyebrows than a film of her vomiting down the loo ever could, but her scripted putdowns, often delivered more in sorrow than anger, are punctuated with oft too ponderous pauses rather than as they should, with the vicious spitting of irate cornered cat. That said, the casting of Anderson as Margo is one of the production's greatest strengths. She is simultaneously brittle and radiant, poised yet fragile. The use of technology, though at times overwhelming, is admittedly sophisticated. At a celebrated Stork Club dinner party a ferocious encounter in the ladies' room between Eve and Karen, who is also the wife of a famous playwright, is projected on to a screen as it happens: at the same time, we see the subjects of their debate swilling champagne downstage. But there is a palpable irony to the fact that we are always conscious of watching a piece of director's theatre. This is very much van Hove's show, whereas All About Eve depicts a vanished theatrical world where sacred monsters like Margo Channing ruled the roost and the writer and director were seen as totally subservient. Shining through all this technology though is Dolan. Her Karen as a woman who inadvertently sabotages both her friend's career and her own marriage, provides another reminder of what a great actor she is. Lily James, though, is less compelling in the role of the manipulative, ambitious Eve. The production never really lets us get under her skin. Eve should drive the narrative, instead here she feels secondary - to Margo and the scenery. It is only really as the huge portraits of Margo get replaced with Eve that we feel she is taking over. It is a good evening in the theatre, but some essential spark is missing. I will always remember Anderson as Margo, but I can't help longing for van Hove to give up on remaking movies and return to rethinking plays.